Designer dogs, selective breeding, clones and intensive breeding are having unintended effects on the health and wellbeing of man's best friend – so is our love of pups actually bad for them in the long run? Often the gene for a desired trait is genetically linked with another gene that causes, and sometimes even directly leads to, disease. In this way, selective and intensive breeding at once reduces genetic variation and increases disease risk. Most modern breeds have very low genetic diversity, and it's decreasing with every new generation. Current cloning technologies require hundreds of donor eggs and many surrogate dogs to achieve the birth of a healthy clone. 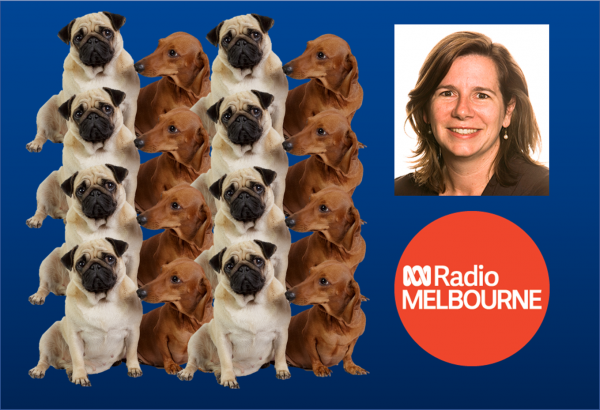 Associate Professor Munsie: "There is an obvious ethical problem with cloning in that huge resources are put into producing cloned dogs when so many dogs are being abandoned in shelters every day. But there is also a hidden cost. Cloning is terribly inefficient, and the cost is other dogs. With a price tag of A$50,000-A$100,000, cloning your dog or other pet will be prohibitively expensive for most people. People may also be deterred by the disappointment that the clone isn't exactly the same as their original pet. It's likely that for those who are able to pay the money, they are likely to accept and love their clone, even if it isn't identical, because it preserves a link to the pet they've lost. But treasuring the memory of a much-loved pet, and maybe forming new memories with a new pet is likely to remain the norm." Associate Professor Munsie spoke to David Astle on ABC Radio Melbourne (774 AM) on Monday 8 October at 9pm. Catch up on the broadcast here (start player at 2:07:20 for Associate Professor Munsie's appearance).